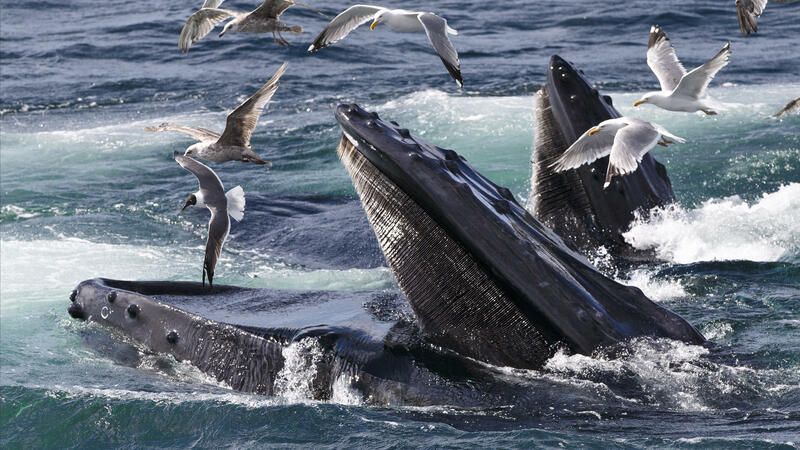 Humpback whales feed at the Stellwagen Bank National Marine Sanctuary near Provincetown, Mass., in July 2014. As the curator of fossil marine mammals at the Smithsonian Institution's National Museum of Natural History in Washington, D.C., Pyenson has examined whale fossils that are tens of millions of years old. He has also learned about modern whales by attaching sensors to them in the wild and by studying their carcasses at commercial whaling sites. "We live in the golden age of whale science because there's so many new tools that we have to investigate their hidden lives," he says. Pyenson notes that the largest whales alive today are the biggest vertebrates that have ever existed: "No dinosaur was heavier. No other mammal exceeded their length or width," he says. "They are absolutely the largest vertebrate animals to have ever evolved in the history of life on Earth." Pyenson's new book is Spying on Whales. Some species of whales — especially the deep-diving ones — can hold their breath for over two hours. And that's a remarkable feat in its own right, but I think even more so when you consider that in those cases, they're diving over 9,000 feet deep in search of prey. ... It's kind of like holding your breath while chasing after your food for over two hours and then coming back to the surface. And these species of whales — the deep-diving, beaked whales — they do this routinely many times a day. And you can think there's all kinds of great physiological questions about how this works, how these animals are able to achieve this amazing feat multiple times a day. They are so big, and they are so cumbersome to investigate. The tools you need to open up the carcass of a 70-foot mammal are too big to really comprehend. And your opportunities to actually investigate a carcass like that where it hasn't started to decay are very rare and fleeting. You would think that for all the whales that have ever been killed through the process of whaling all around the world — in the 20th century alone, some 2 to 3 million whales were killed through whaling by many nations — yet very few those whales were actually investigated by biologists of any kind. One of the most startling finds was the strange tangle of blood vessels and nerves that we found lodged right in what would be the chin of these whales — sort of the tip of the snout on the lower jaws. ... We're talking about jawbones that are almost the size of telephone poles — each the right and the left jaw — and there's the space between them. We started putting the different pieces of evidence together ... which told us that the nerves and blood vessels were really what we thought they were: pressure sensor devices. And when we look at the biomechanics of how these animals feed, it appeared to be a way for these very large whales to coordinate just how much their jaws were able to open and close in the course of this lunch feeding activity that they undertake every day. By the 1960s, the U.S. Navy was funding a lot of research into understanding how echolocation works, because it had such an important technological consequence. And even today, still, the sonar that's used by the military is not as sophisticated as that of the ones that toothed whales use to navigate the world. The oceans have gotten to be a lot noisier places, and this is a big issue for whales whose habitats that they want to feed in overlap directly with the places where our cargo ships and cruise ships most frequently go. And I'm thinking about places like Boston Harbor or port of Los Angeles. Those are two prime spots where there's a lot of shipping activity, big ships moving out frequently, and it is right next to prime habitats for very large baleen whales and so ship strike is a big concern. Whales, even the largest ones, can't move quickly enough to get out of the way of these ships, which move much faster and are much, much larger. So, unfortunately a lot of whales are victims of ship strike, which is just incredible trauma. Another feature is ... the noise, the churning in those engines, makes those environments much noisier. And if you're a whale, a lot of your livelihood depends on acoustics being able to hear and also being able to make sounds, so there's good evidence that in these busy ports, whales are having to sing and communicate louder and at different frequencies just to get over the noise. This is FRESH AIR. I'm Dave Davies in for Terry Gross, who's off this week. Pretty much everybody loves whales, and most of us know something about them. But when I read Nick Pyenson's book, I was amazed at what I didn't know - that their biological ancestors walked on land, that some whales can hold their breath for two hours while diving for food and that others can live 200 years. Nick Pyenson is the curator of fossil marine mammals at the Smithsonian Institution's Natural History Museum in Washington. He studies whales in a lot of ways - by extracting fossils tens of millions of years old from the earth, by attaching sensors to live whales from the side of a boat and by visiting commercial whaling sites where whale carcasses are dismembered and their anatomies exposed. I spoke to Nick Pyenson about his new book "Spying On Whales: The Past, Present, And Future Of Earth's Most Awesome Creatures." Well, Nick Pyenson, welcome to FRESH AIR. One of the things you say in the book is that we kind of sometimes think that there was an age of giants millions of years ago. You say not so. NICK PYENSON: Right. The largest whales that have ever been live right now, and it just doesn't so happen to be that they're kind of large. They are absolutely the largest vertebrate animals to have ever evolved in the history of life on Earth. No dinosaur was heavier. No other mammal exceeded their length or width. Whales are the biggest vertebrates ever to have evolved, and that happened relatively recently in geologic time. So there's a really interesting evolutionary story here when you look at how whales came to be giants of the sea. DAVIES: Right, and you write about evolution a lot. And one of the fascinating things that I learned in this book is that if you go far back enough in time, whales or their ancestors walked on land. Yeah, what did they look like? PYENSON: Yeah, I think that's another surprising fact - that whales have a evolutionary history that extends over millions of years into geologic time. And we have direct records - fossils - of the earliest whales - 40 to 50 million years old - that had four legs, four weight-bearing legs. So these were animals that moved about on land. And we can tell that they're whales based on key features of their anatomy, specifically parts of their skull. But they did live on land to some degree. We think that a variety of these early whales had different kinds of lifestyles. Some were living in more brackish water environments, some component of living on land and a little bit in the water. But they were certainly not like the whales that you would see today. And that's one of the great things about looking at the fossil record - is that it tells us things about the deep past that we wouldn't otherwise know. If we didn't have fossils, we wouldn't know about the ways that whales have transformed from land ancestors to the whales that we see today, which are so different from every other mammal that they're closely related to. DAVIES: How big were these four-legged whales? PYENSON: Oh, I think in the book, I describe them as being about the size of a large domestic dog. But there are many different stripes of these early whales. And if you saw them, some would look vaguely familiar. They might look like a hooved dog - some kind of blend of animals that we know about today. And then there are other kinds of early whales that really don't have much of an analog. They might have looked like a long-snouted otter. And that's just - something that's pretty common when you're a paleontologist is that you realize the variety of extinct life is so very different from what we see today. And that's just because of the history of life on Earth, that we are only sampling the most recent, barely 1 percent of all the life that ever once lived when we look at the tree of life. And by looking at the fossil record, we're able to look at these extinct branches on the tree of life that we wouldn't otherwise know about unless we had recovered them from rocks. DAVIES: So do we know what got whales back into the water and made them these aquatic mammals? PYENSON: I think that there's a variety of possibilities, not all of which are easily tested. So it might be that there's too many predators on land, and you can make a much better living going out to the water. Or maybe there's a lot more food resources, and those two possibilities aren't mutually exclusive. But they're really hard to test with the available evidence. So I think what is easier to show, using the fossil record, is the how - not so much the why questions, but how earliest whales transformed from living on land to living in the water. And we can see that in a variety of the clues that we can look at in their skeletons, whether it's the change from limbs that are weight bearing - and so they kind of look cylindrical and almost like table legs - to limbs that are flattened if they're forelimbs and become more like flippers or if they're hindlimbs and completely disappear. We can look at changes in their skull that allow their nostrils to migrate slowly backwards over their skull to assist in breathing underwater and all the other changes that we can infer - from changes into how they see, changes into how they smell, how they feed - whatever we can infer from their skeletal remains. We actually have that for the fossil record of whales, and that's not true for a lot of the other vertebrate groups that we may be interested in. DAVIES: Right. So one of the ways that - one of the things that happened was that the land-based whale ancestors had snouts like a dog. The whales that we know of today have a blowhole in the back of their heads, so it kind of migrates backwards. DAVIES: Right. And then you - there's a picture in the book of a transitional creature - basilosaurus. Do I have this right? Describe that. PYENSON: And it's funny because it has a name that makes you think it's like a dinosaur. Basilosaurus means king lizard, and it actually is one of the first fossil whales to have been found. It was found in the 1840s, and its discoverers thought it was a giant sea serpent. So hence the name basilosaurus. DAVIES: How big was it? PYENSON: Oh, about 40-feet long. PYENSON: And, you know, if you come to the Smithsonian, you can see it in the Sant Ocean Hall - we have one mounted - and walk right underneath it along its sneaky skeleton. It's really something to behold 'cause you can see so much of its anatomy and these really, really small hindlimbs that clearly didn't have any ability to support its weight on land. But if you look at its forelimbs, those are limbs that still have elbows, like land mammals. But its hands already are much more paddle-shaped. So this is very much one of these early whales that - it's a snapshot into the evolutionary history of early whales just as they're starting to become a lot more adapted to living in the water full-time. DAVIES: So if we look at the whales of today, they're divided into whales that have teeth and those that don't. And some of the largest ones lack teeth. These are called baleen whales. Explain what baleen is. PYENSON: So baleen are long, fibrous almost structures that hang from the roof of the mouth of the largest of the whales. And, as you said, it's in - only in one group of the two groups that are alive today that have baleen. They use it for filter feeding. It's a structure that is actually a lot more anatomically complex than you may first realize. It's made out of keratin. So it's the same kind of molecule like the stuff that makes up our fingernails and our hair, but it grows down in sheets from the roof of the mouth in these very large whales. And they almost form these kind of plastic-like curtains that - when the whale opens its mouth - are able to strain out any kind of prey - fish, krill, smaller zooplankton - and keep the prey inside their mouth and let the water sieve out. We know that there's a variety of different ways that different species of baleen whales filter feed. Some do it by skim feeding, so there's one direction of water flow. Others, like blue whales and humpback whales, they're gulp filter feeders. So they take in an enormous volume of water in one big gulp and then slowly strain out the water while keeping the prey inside their mouth. We know it must work pretty well because this is the way that blue whales and all these other large baleen whales maintain their enormous body size on a daily basis. And so you might imagine that they have to feed a lot to keep being as large as they are. DAVIES: Right. And some of these animals and some of these whales engage in lunge hunting. DAVIES: Do you want to just explain how that works and what it does to their jaws (laughter)? PYENSON: Right. So this is one of the ways that whales almost don't seem like mammals. They seem more like an egg-eating snake or something like that where they're able to lower their jaws almost to 90 degrees sometimes as they're coming up on a large bait ball or aggregation of krill. And then, as they're doing that, their throat pouch expands dramatically. So that's kind of the soft tissue that hangs underneath their jaw, and it's full of pleats. You may have seen this in videos online or in natural history films. But they come upon this large bait ball, open their mouths, and it completely changes their entire body form. They go from a very streamlined animal and, moments later, become basically a parachute underwater. DAVIES: Yeah, bubble-net feeding - this is fascinating. DAVIES: Explain what that is. PYENSON: So this is - and what it amounts to is a whale swimming underneath a bait ball and corralling them with bubbles emitted from their nostrils. If done precisely - sort of in a circle - will create a column, a curtain of bubbles that rapidly go to the surface. And it has the effect of confusing fish and keeping them tightly bound together. One whale will do that and create the curtain while another one comes right underneath, surging up from the depths and opens its large mouth and takes in it - whatever's trapped in a barrel nearly. And it's just a spectacular thing to observe. And one of the great things about studying whales today is that we live in an instrumented world. So we have so many more tools to be able to observe this. It's not just seen-it-from-the-deck-of-a-whale-watch-boat. We can see it overhead from drones, and we can put tags on the backs of whales and actually see how this works biomechanically - all the changes in speed and direction and pitch, yaw and roll that might happen to an individual whale doing this. And then, again, if we have cameras underwater, we could see it. So it's such an exciting time to investigate all these aspects of the lives of whales - not just their evolutionary past, but what they're doing today. DAVIES: How long can these animals hold their breath? DAVIES: Nick Pyenson is a marine mammal paleontologist at the Smithsonian Institution. His new book is "Spying On Whales: The Past, Present, And Future Of Earth's Most Awesome Creatures." We'll continue our conversation in just a moment. This is FRESH AIR. DAVIES: This is FRESH AIR, and we're speaking with Nick Pyenson. He studies whales. He's the curator of fossil marine mammals at the Smithsonian Institution's Natural History Museum in Washington. His new book is "Spying On Whales: The Past, Present, And Future Of Earth's Most Awesome Creatures." One of the things that's interesting about this book is all the different ways that you study these animals. I mean, you go on research boats and attach sensors to whales. DAVIES: And you spend a lot of time, as a paleontologist, you know, digging fossils out of - you know, that are tens of millions of years old out of various formations and - because you wanted to understand their anatomy, you went to a whaling station in Iceland where these animals are cut up. Just kind of describe what you saw there and what your role was. PYENSON: So what happens in Iceland is it's a commercial whaling operation. They target one species of whale - fin whales, which are the second longest. There are some 50,000 fin whales probably in the North Atlantic. And this whaling company has a quota to hunt as many as just over a hundred fin whales each year. And it's a long tradition in Iceland that was mostly industrialized after World War II. And so what they do is they hunt the whales, bring them back to a station where their meat is removed from the carcass. It's flensed off. That's the specific term. And that meat is then sold, either domestically or internationally. So what we had was an opportunity to look at these carcasses and investigate them using all the tools that were available at the whaling station to actually separate meat from bone. And that proved to be incredibly useful for answering so many questions we had about the anatomy of these very large whales. And that has a lot to do with the basic problem of studying whales in the first place, which is they are so big and then they are so cumbersome to investigate. The tools you need to open up the carcass of a 70-foot mammal are too big to really comprehend. And your - opportunities to actually investigate a carcass like that, where it hasn't started to decay, are very rare and fleeting. So in Iceland, we had this unique opportunity to work with whatever material was not actively being processed. DAVIES: So you and your colleagues are, like, hanging around with big knives, saying, hey, can I look at that artery before you throw it away or something like that? PYENSON: That is exactly what we were doing - opportunistic, anatomical research. DAVIES: And you'd made a discovery, something that we didn't know that these baleen whales have. You want to describe this? PYENSON: Sure. And I think that's - that was such a remarkable thing because you would think that for all the whales that have ever been killed through the process of whaling all around the world - in the 20th century alone, some 2 to 3 million whales were killed through whaling by many nations, yet very few those whales were actually investigated by biologists of any kind. PYENSON: Tangle of nerves and blood vessels. DAVIES: ...That you hadn't noticed before at a critical place - right? - in the chin of these whales, right? PYENSON: Right. One of the most startling finds was this strange tangle of blood vessels and nerves that we found lodged right in what would be the chin of these whales - sort of the tip of the snout on the lower jaws. And so this is a fleshy nub that's between two very, very large bones. We're talking about jawbones that are almost the size of telephone poles each, the right and left jaw. And there's the space between them. And when we started examining that in more detail, we realized it wasn't just space filled with cartilage or some kind of extra bits of tissue. It actually had blood vessels and nerves. And so that seemed unusual to us and worthy of more investigation. And we were able to take some tissue samples back to the laboratory and look at them under a microscope. And when we started putting the different pieces of evidence together - so microscopic slides which told us that the nerves and blood vessels were really what we thought they were, pressure sensor devices - and when we look at the biomechanics of how these animals feed, it appeared to be a way for these very large whales to coordinate just how much their jaws were able to open and close in the course of this lunch feeding activity that they undertake every day. DAVIES: One of the questions you have pondered is, why did these baleen whales become so big? Did discovery of this bundle of nerves help answer that question? PYENSON: It did in a funny way because it was an anatomical discovery that answered in some ways a key biomechanical question we had. How are whales able to undertake this incredibly expensive activity of opening and closing their enormous mouths underwater? That's an answer of how it works. If you want to know how it came to be, that's an evolutionary question. And we're able to compile a very large database of the size of fossil whales through time, and what you see is not just a gradual increase in body size, but that very large body size - that is to say, whales the size of blue whales or fin whales more than 60, 70, 80 feet long, more than 200,000 pounds in weight - that is a very recent geologic phenomenon that only happened in the last 4.5 million years. And what's interesting about that timeframe in Earth history is that coincides directly with the onset of ice ages. Now, we're still living in an ice age right now. But these are cycles that are relatively recent in Earth's history that have led to glaciation in the Northern Hemisphere, not just in the Southern Hemisphere. So we have ice on both poles. Consequently, for animals that live in the oceans, ice ages mean productivity that's very concentrated in time and space. So instead of having just abundant resources kind of distributed throughout, what the ice ages did is made the availability of the food that whales would seek patchy and patchy in space and time so that there are specific places and specific times where a lot of food will be concentrated. DAVIES: So if you can swim hundreds of miles, you can score big. PYENSON: Yeah, that is exactly right. So there's a huge return on the investment for migrating long distances. So we think very large body size is helpful if you want to migrate very long distances. It also deters predators. There's a lot of good reasons for evolving very large body size if that's how the world is. And so I think our explanation about the ice age seas is probably a pretty good one for - at least for baleen whales. DAVIES: Nick Pyenson is the curator of fossil marine mammals at the Smithsonian Institution's Natural History Museum in Washington. His book is "Spying On Whales." After a break, he'll tell us about whale's remarkable echolocation abilities and what we know about their sounds, which can travel for hundreds of miles. Also, Maureen Corrigan likes a debut novel about seduction, spiritual uncertainty and college students. I'm Dave Davies, and this is FRESH AIR. DAVIES: This is FRESH AIR. I'm Dave Davies in for Terry Gross, who's off this week. We're speaking with Nick Pyenson, a marine mammal paleontologist from the Smithsonian Institution whose new book explores the many wonders of whales - their enormous size bigger than any dinosaur, their evolutionary history - their ancestors walked on land - and remarkable facts about how they eat, breathe and communicate. Pyenson's book is "Spying On Whales." You know, we talked about the baleen whales, which don't have teeth. They have these softer tissue filters which allow them to trap organisms and eat them. We think that they hunt a lot by sight, right? But the toothed whales use echolocation, which is pretty sophisticated, right? Tell us about that, how it works. PYENSON: Yeah, echolocation is a way that toothed whales navigate their environment using sound. And echolocation itself has only evolved so many times in the history of life on Earth. Bats use it to echolocate, but toothed whales are the only animals to use it, as far as we know, underwater. And the way that toothed whales do this is using a complex set of sinuses and muscles and fat pads right above their forehead that are part of what is essentially their blowhole. And right in front of that complex set of air sacs and muscles is a large fat pad. It's called the melon. And you probably best visualize this as the dome on a bottlenose dolphin's head. So that's a very large fat pad that's kind of dome-shaped. And as best we can tell from experiments done on captive dolphins that are alive, sound is emitted from these sinus passages and sent through the fat pad. And it acts almost like an acoustic lens to focus it. And this has very high-frequency sound that is exiting the forehead of these whales. DAVIES: And how far does the sound travel? I mean, how widespread does the information gathering go? PYENSON: It probably doesn't extend for miles. It's a function of just how strong that signal is. You can think of it as a kind of acoustic flashlight on the forehead of these whales. So in the same way that, if you run around the woods at night and you have a flashlight, you can - if you look at the flashlights of your friends, you can tell what they're doing, and they can tell what you're doing, but that's pretty much it. That's the extent of the range of, you know, using that analogy, that's the extent of the range of just how far they can use that sound. But, you know, the power of that signal is very - is based on the body size of these whales. Sperm whales have an incredibly powerful echolocation organ on their skulls that can be up to 20 feet long. DAVIES: Right. You write that it's more sophisticated than kind of military sonar. PYENSON: Right. There's such an interesting history of investigating how echolocation works in whales. It was largely funded by the U.S. Navy in the 1960s because it seemed like such a sophisticated sense that we really didn't have much of an understanding about. And what - it's a very interesting story. And there's a great book that describes how whales went from objects of industry and were consumed for whale meat and for oil, in particular, to subjects of military research to look at how echolocation works. That transition happened in only a few decades. And by the 1960s, the U.S. Navy was funding a lot of research into understanding how echolocation works because it had such an important technological consequence. And even today, still, the sonar that's used by the military is not as sophisticated as that of the ones that toothed whales use to navigate their world. DAVIES: What do we know about the sounds whales make - how far they go, what their purposes are? PYENSON: Yeah. So there's a variety of different sounds that are both at high frequencies and low frequencies. The lower frequency ones tend to be the ways that whales communicate. So these are more like the squeaks and groans that you've probably heard on a variety of soundtracks. I mean, it's remarkable to me that whale song was put on the Voyager space probes. So Voyager 1 and Voyager 2 have these golden records that have whale song on it, and it's a humpback whale song. And, you know, we all have our different emotional responses to that. But the fact of the matter is we don't really know what they're saying because we don't know the context. I mean, whales could be telling you what they had for lunch or the meaning of the universe and we could not discriminate the difference between those two choices. DAVIES: And do we know how far the sound carries? PYENSON: For some of the largest whales, like blue whales, that sound at specific frequencies - and sound will travel through water depending on different - in different ways and different distances depending on the temperature and the salinity of water. But under the right conditions, those sounds by blue whales can travel over hundreds of miles. DAVIES: And one of the threats to whales that we hear about is noise pollution in the ocean as we have more and more vessels churning through. What sort of problems does it present for the whales? PYENSON: Right. The oceans have gotten to be a lot noisier places. And this is a big issue for whales whose habitats that they want to feed in overlap directly with the places where our cargo ships and cruise ships most frequently go. And I'm thinking about places like Boston Harbor or Port of Los Angeles. Those are two prime spots where there's a lot of shipping activity - big ships moving in and out frequently - and it is right next to prime habitats for very large baleen whales. And - so ship strike is a big concern. Whales, even the largest ones, can't move quickly enough to get out of the way of these ships, which move much faster and are much, much larger. So, unfortunately, a lot of whales are victims of ship strike, which is just incredible trauma. Another feature is - just as you were talking about - the noise. The churning of those engines makes those environments much noisier. And if you're a whale, a lot of your livelihood depends on acoustics - being able to hear and also being able to make sounds. So there's good evidence that, in these busy ports, whales are having to sing and communicate louder and at different frequencies just to get over the noise. And this is one of the consequences of the recovery of whale populations after whaling - is that, in many cases, they have recovered, but now they're encountering different kinds of threats on planet Earth in the age of humans. So on the Eastern Seaboard here, North Atlantic right whales are frequently threatened by entanglement in fishermen ropes. And so right whales are feeding in these same habitats where there's a lot of fishing going on, and right whales end up entangled. And this can be just tremendously exhausting because the right whales tend to drag these fishermen traps all over the place - hundreds of miles - or sometimes ropes that get - end up entangled in their mouths and over the nostrils, and that leads to a lot of mortalities. And this is a big problem for North Atlantic right whales because there are only 450 or so left. They really haven't recovered from whaling that happened nearly 200 years ago. So while whaling doesn't really happen at a large enough scale to be a threat to whales today, it's a lot of the other byproducts of civilization, I think, that are the most active threats to whales. You know, in describing the era of unrestricted commercial whaling - I guess, in the 19th and 20th centuries - I think you write, in the book, probably the largest single loss of biomass in history. Give us a scale of, you know, what the population of whales was, how many were lost and its impact. PYENSON: We can - I think we can summarize that looking at blue whales. You know, these are the largest animals ever to have evolved in the history of life, much heavier than the largest dinosaurs that we know of. And blue whales are globally - they're endangered. Their population size is 1 percent of what they used to be at the start of the 20th century. Some several hundred thousand blue whales were killed in the course of the 20th century. And they are obviously the largest species, so there is the most to gain from hunting them for oil. But the systematic removal of all those blue whales has had far-reaching consequences that have persisted all the way through to today in the 21st century - that we are still not seeing as many blue whales as there once were. And so there's a loss of genetic diversity. There's a loss of where those populations are in the world. You may be lucky enough to see blue whales off the coast of California or maybe rarely off the Eastern Seaboard today, but there were certainly many, many, more blue whales before whaling in the 20th century. And so you have to wonder what's been lost from an ecological standpoint. Were ocean ecosystems at the start of the 20th century different than they are today? Were they able to somehow sustain more blue whales than they can today? Those are really important research questions. DAVIES: What happens when a whale dies? What happens to its carcass? PYENSON: So it depends on where a whale dies, but, you know, if it dies out at sea, its carcass can fall through the water column all the way down to the sea floor, which may be hundreds to thousands of feet below. And if it reaches a certain depth on the sea floor, there's a whole community of organisms that will colonize that carcass. And we're just now beginning to discover how many different kinds of species a whale carcass can sustain on the ocean floor. This is research that's not more than 30 years old because the discovery of what are called whale fall communities is a very recent thing. And when we've realized that the amount of biomass on the sea floor basically creates some kind of an island of nutrients in an otherwise abyssal desert on the seafloor, it means those communities may be able to persist for many decades - maybe as much as a hundred years depending on how large the whale carcass is. DAVIES: You write about bowhead whales in the Arctic. What's distinctive about them? PYENSON: They're the one true polar whale. Their entire lives are circumscribed to the Arctic. One of the most remarkable things, at least to me, was the fact that they can live very, very long periods of time - in some cases, maybe over 200 years. So a bowhead whale born today in the Arctic may live for up to 200 years into the future. And I think one of the most remarkable things is to imagine what it might experience because it will certainly see an Arctic that none of its ancestors had seen. And I'm not just talking in terms of changes in ice cover, but also with the increase of human presence in the Arctic because, clearly, with a melting Arctic, it'll be much more available as a shipping lane. - Northwest Passage will become ice free in the summers. And so that's going to dramatically change the human threats that are imposed on this species that lives only in the Arctic. DAVIES: There's a detail that you tell that I just love, which was that in 1992, I think some - someone had - were looking at the carcass of a bowhead whale and discovered traces of a stone harpoon. This is in 1992. And stone harpoons had not been used in how long? PYENSON: Over a hundred years. DAVIES: Wow. And that's how they knew that they were - that they lived to such old ages? PYENSON: Right. There was good evidence before that time that they would find antique hunting implements in bowhead whales, which are killed in the Arctic as a matter of sustenance for indigenous peoples. And people have recorded what they found inside bowhead whales, specifically healed wounds from old strikes. And some of these wounds contain very old, out-of-date hunting implements. And in this one case, in 1992, they found a specific kind of tool that had a known lifetime. And whaling technology had a specific turnover from stone tools to metal tools in the 19th century. And so you can pin pretty precisely the age that the whale must have been when it was first struck and then it was an unsuccessful hit because that whale had to have been large enough to survive that injury all the way from the 19th century to 1992. And there's a separate line of evidence from the proteins in the eyeball and the ways in which they decay, and you're able to actually plot that out on a graph. And when we have different lines of evidence pointing to the same kind of answer, it really lends a lot of strength in science. So the evidence for bowhead whales living more than a hundred years - in some cases, maybe 200 years - boy, they're really almost like time machines to me. DAVIES: You know, as I read your book, it reminded me of something. Years ago, I spoke to an entomologist named Mark Moffat who'd spent a career studying ants. And he had an affection for these ants. And he could really get close to them and see them eat and, you know, fight and build their communities and - you write in the book about how there's so much about whales that we can't see. I mean, we have more sophisticated ways of learning about their lives now, but they're at these huge, unimaginable depths so much. And I'm just wondering, do you have an affinity for them? Do you sometimes picture these whales moving among continents at these incredible depths? PYENSON: Oh, sure. I mean, I think the whole exercise of trying to think about how we study whales is really an exercise of the imagination because we really have to think carefully about the scale of their lives. They live remotely, so they're inaccessible. I mean, we see them only when they come to the surface, unless we've slapped a tag on their back or if we're spying overhead with a drone. We hardly know how many whale species there are on the planet. There are still discoveries yet to be made. I mean, it really forces you to imagine what life must be like as a whale living in the water. And then projecting that backwards in time into the geologic past when continents were in different positions and ocean currents were doing different things - those kinds of exercises of the imagination are incredibly important also today because we want to know what the fate of whales is going to be on planet Earth in the age of humans. DAVIES: So almost like they're aliens living among us. PYENSON: Yeah. I think that's actually a very good way of describing them - that they're inscrutable, that they're benign, yet they're very, very enigmatic. There's so much we don't know. And as a scientist, that is just captivating. Whales can be a vehicle for answering so many questions that we have, no matter the kind of science you're interested in. DAVIES: Nick Pyenson, thanks so much for speaking with us. DAVIES: Nick Pyenson is the curator of fossil marine mammals at the Smithsonian Institution's natural history museum in Washington. His book is "Spying On Whales: The Past, Present, And Future Of Earth's Most Awesome Creatures." DAVIES: Coming up, Maureen Corrigan tells us about a debut novel dealing with spiritual uncertainty and campus life. This is FRESH AIR. (SOUNDBITE OF CLARK TERRY'S "IMPULSIVE") Transcript provided by NPR, Copyright NPR.